The image shown above shows in great detail how far the khbbs patch progress is. It’s a RED screen! What’s the purpose of the RED screen for the Kingdom Hearts: Birth By Sleep Patch? It means that it’s decrypting! ZOMG ZOMG ZOMG! Oh, and here’s some interesting info about the screenshot above as well as the khbbs patch progress in general. 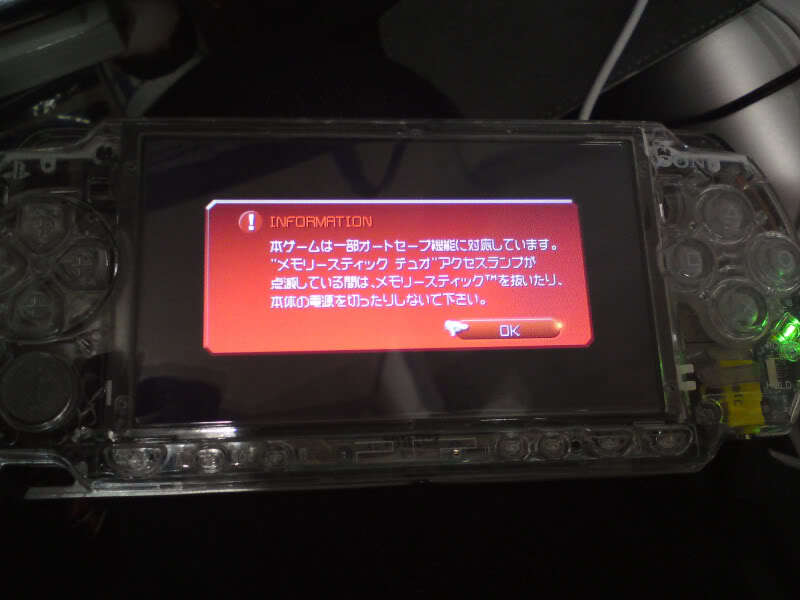 The game itself has no internal protection. His basic decryptable any game, only to be done manually so a 6.20 would make automatic decryptor. Now our problem is something else. Set-UMD ISO removed and running: functional play, but if the game loads something (a cutscene, keep heading …) crashes. And this why? My theory is that, because the UMD, the game “takes” the files from the 6.20 update the game itself, loading the data from the UMD itself rather than on the flash0. This is because the game does not require access to the Memory Stick Data unless an Install. I think if there is no UMD, although the game is not on the Store, you can change the line of code to access the MS. Everything is centralized in Archivito: System Data. This file is simple, is the trigger for all charges and saved the game. And one final charge is the fight against a boss, a change in the world, a cutscene … not several protections in the game. The problem occurs when the game “find” the files that relate kept the 6.20, and not find them. So my theory is this. It should create a plugin rather strange, but already has a predecessor: Anti CFW. This new plugin you have to do is include or emulate the needed files from the 6.20, and should be tried, or that the game creates a UMD inserted to bring those files, or change any lines of code in the ISO in order to restore its load him. And here enters the picture CWCheat, a trick + the plugin would achieve this. This is only an assumption, but of course copy operation is a mere failure of compatibility. We must either change, or emulate, through a plugin or in the CFW, the files that relate to the saved and loaded the 6.20, some of vsh prx / module of the flash0. With that, the game will have no problem with the loads, and what does this mean? That will have nothing more to protect themselves. That is, the patch IS READY AND FINISHING, but now you need the game ISO is created that, without the UMD, we are able to read those files from the 6.20. The easiest solution is a 6.20 CFW, but since it is possible for now, a plugin is the best solution. Only work on 5.50 GEN D-3, because we rely on your modules. Once the final khbbs patch comes out, I’ll be sure to post an update/download link 😀 Stay tuned!